Freia has plans for summer that include hanging with her friends and spending quality time with her boyfriend. Then her parents share some devastating news and her dream summer looks as though it will be anything but. While her home life is in upheaval Freia feels she can’t tell anyone what is really going on. 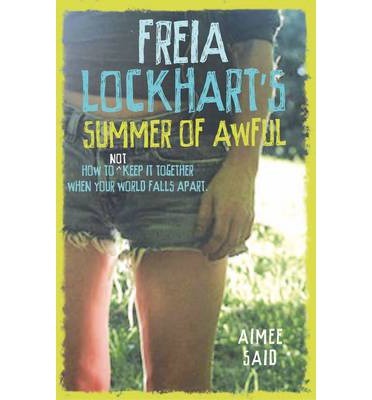 To make things worse her boyfriend has gone away and Freia thinks maybe he doesn’t want to be around her anymore. Added to the problem Freia’s grandmother has come to stay and this only ups the tension at home. Tension that is added to by her brother’s argumentative behaviour. Freia is a thoroughly believable and nuanced character. She is not perfect and because of that it makes it easier to identify with her. She feels out of her depth in the situation she finds herself in and so much is out of her control. The people around her, her family and friends, blend well together, all playing their own parts which sometimes overlap. This is a story about self discovery, friendship and overcoming the curveballs that life can throw your way.